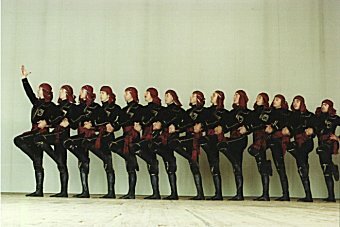 KHORUMI is one of the most popular dances from Georgia. It dates back to the period of the heroic war against the conquering armies of the Turks, Mongolians, and other nations. It is composed of four parts: the search for the suitable spot for the fighter of the underground army, the approach of the enemy, the battle and the defeat. Choreography by I. Sukhishvili and N. Ramishvili. 1945. Copyright © 2002. Georgian National Ballet. All Rights Reserved.